New year's eve is the day to get ready for the coming year. It is also the time for many Japanese people to eat traditional "Toshikoshi soba". Toshikoshi soba is year-crossing buckwheat noodles, that is eaten in Japan on New Year's Eve. The reason to eat the noodle is that the noodles represent longevity and the long-lasting prosperity of the family. So, it is important to finish all the noodles before the end of the year. Toshikoshi soba can be served cold or hot as you like. 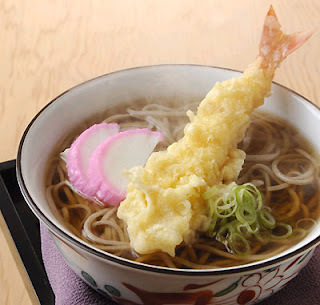 I myself ate Toshikoshi Soba in a hot soup, topped with a large shrimp tempura at the year-end of 2010. In Japan, Eating the noodles after the start of the year is believed to bring bad luck.